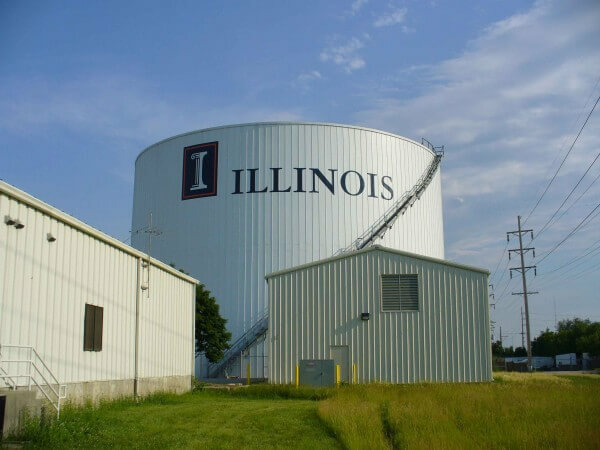 MC&I designed, manufactured and installed the RIDGLOK® Vertical Standing Seam Insulated Panel System on a Thermal Energy Storage (TES) ground storage tank, located in Champaign, IL for the University of Illinois. The thermal energy storage tank was a 118.5′ diameter x 78.17′ high tank, with a spiral stair casing. 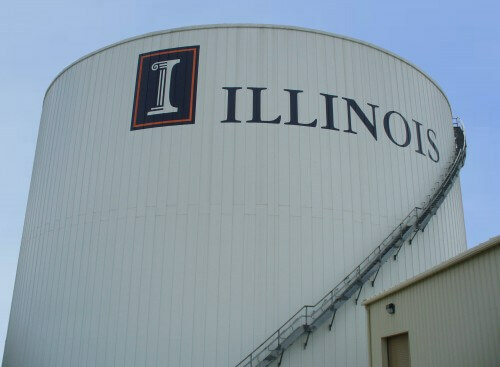 The storage tank insulation project was completed in September, 2010. The RIDGLOK® Vertical Standing Seam Insulated Panel System consisted of 0.024 stucco-embossed aluminum metal jacketing, in White color, laminated to 2″ of polyisocyanurate insulation board (R-value of 13.1), using a radial roof pan system. There are cost savings benefits in insulating TES (Thermal Energy Storage) tanks. Chilled water is produced during periods of off-peak electrical demand when rates are lower, and the water is collected in a thermal energy storage (TES) tank. The chilled water is then withdrawn and distributed throughout the facility during peak demand hours. This process lowers energy costs by reducing the power consumption. Insulating the TES storage tank further increases energy savings by retaining the chilled temperatures within the storage tank.